Lawmakers release plan to enact historic bailout of nation's financial system. Does the bipartisan bailout proposal do enough to protect taxpayers? NEW YORK (CNNMoney.com) -- The federal government would put up as much as $700 billion in a far-reaching plan to rescue the nation's troubled financial system, according to a bill unveiled by lawmakers on Sunday. 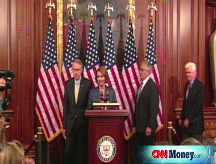 House Speaker Nancy Pelosi, D-Calif., said she hopes the House will take up the bill on Monday. Sen. Majority Leader Harry Reid, D-Nev., said he believes the Senate can move on the legislation by Wednesday. Pelosi said the provisions added by Congress will protect taxpayers from having to pay for the bailout. "We sent a message to Wall Street - the party is over," she said at a press conference with Reid and other Democratic leaders from the House and Senate. The core of the bill is based on Treasury Secretary Henry Paulson's request for authority to purchase troubled assets from financial institutions so banks can resume lending and so the credit markets, now virtually frozen, can begin to operate more normally. But Democrats and Republicans - concerned about the potential taxpayer cost - have added several conditions and restrictions to protect taxpayers on the down side and give them a chance at some of the potential upside if the companies benefit from the plan. "People have to know that this isn't about a bailout of Wall Street. It's a buy-in so we can turn our economy around," Pelosi said. Key negotiators for the financial rescue plan will be busy trying to line up votes on Capitol Hill on Sunday to support the accord they reached soon after midnight. House Majority Leader Steny Hoyer, D-Md., told CNN he believes a majority of representatives on both sides of the aisle can and will support the bill. President Bush, in a statement Sunday evening, said "this is a difficult vote, but with the improvements made to the bill, I am confident Congress will do what is best for our economy by approving this legislation promptly." On Sunday evening, the House Republican working group, which was stringently opposed to earlier drafts of the plan and offered a counterproposal, indicated it would support the bill, and its members are encouraging other Republicans in the House to do the same. "Nobody wants to have to support this bill, but it's a bill that we believe will avert the crisis that's out there," House Minority Leader John Boehner, R-Ohio, told reporters. Doling the money out: The $700 billion would be disbursed in stages, with $250 billion made available immediately for the Treasury's use. Authority to use the money would expire on Dec. 31, 2009, unless Congress certifies a one-year extension. Protecting taxpayers: The ultimate cost to the taxpayer is not expected to be near the amount the Treasury invests in the program. That's because the government would buy assets that have underlying value. If the Treasury pays fair market value - which investors have had a hard time determining - taxpayers stand a chance to break even or even make a profit if those assets throw off income or appreciate in value by the time the government sells them. If it overpays for the assets, the government could be left with a net loss but would get something back on the open market for the assets when it eventually sells them. If it ends up with a net loss, however, the bill says the president must propose legislation to recoup money from the financial industry if the rescue plan results in net losses to taxpayers five years after the plan is enacted. In addition, Treasury would be allowed to take ownership stakes in participating companies. In cases where the government buys troubled mortgage loans directly from banks, it can adjust them more easily. Limiting executive pay: Curbs would be placed on the compensation of executives at companies that sell mortgage assets to Treasury. Among them, companies that participate will not be able to deduct the salary they pay to executives above $500,000. They also will not be allowed to write new contracts that allow for "golden parachutes" for their top 5 executives if they are fired or the company goes belly up. But the executives' current contracts, which may include golden parachutes, would still stand. Overseeing the program: The bill would establish two oversight boards. The Financial Stability Oversight Board would be charged with ensuring the policies implemented protect taxpayers and are in the economic interests of the United States. It will include the Federal Reserve chairman, the Securities and Exchange Commission chairman, the Federal Home Finance Agency director, the Housing and Urban Development secretary and the Treasury secretary. A congressional oversight panel would be charged with reviewing the state of financial markets, the regulatory system and the Treasury's use of its authority under the rescue plan. Sitting on the panel would be 5 outside experts appointed by House and Senate leaders. Insuring against losses: Treasury must establish an insurance program - with risk-based premiums paid by the industry - to guarantee companies' troubled assets, including mortgage-backed securities, purchased before March 14, 2008. The amount the Treasury would spend to cover losses minus company-paid premiums would come out of the $700 billion the Treasury is allowed to use for the rescue plan. Paulson first announced the administration would seek an economic bailout plan on Sept. 18, after meeting with key lawmakers in the House and Senate - a meeting that left lawmakers looking ashen when they spoke to the press afterwards. If enacted, the rescue plan would be the most dramatic and extensive government intervention in the economy since the Great Depression. President Bush on Sept. 24 gave a prime-time address to the nation in which he urged lawmakers to pass his plan and warned that the "entire economy is in danger." The aim of the rescue is to unfreeze the credit markets - short-term lending among banks and corporations. The core of the problem is bad real estate loans that have led to record foreclosures when the housing bubble burst and home prices declined. In the past two weeks, the banking world and Wall Street have been reordered by a wave of collapses and corporate mergers. The most recent development was the seizure by federal regulators on Thursday night of Washington Mutual, once the nation's largest thrift and a major mortgage lender. The chill of the credit freeze has been felt far beyond Wall Street, as well. Businesses large and small have seen the cost of borrowing spike higher. At the same time, the scale of the administration's plan - and the quick pace of the debate over it - has given pause to many Americans and lawmakers worried about its potential cost to taxpayers. "We begin with a very important task, a task to stabilize the markets, to protect all Americans - and do it in a way that protects the taxpayer to the maximum extent possible," Paulson said early Sunday morning. 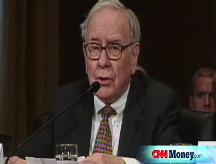 CNN's Jessica Yellin and Deirdre Walsh and CNNMoney.com's Chris Isidore and Tami Luhby contributed to this report. An earlier version of this article incorrectly reported that Congress had publicly released a draft bill that CNN obtained.